On average, 250 tons of ore must be mined and processed to produce a one carat Diamond of gem quality. Anything this rare is also precious. The value of a gem quality Diamond is determined by a combination of four distinct factors. These are called the 4C's. Before you purchase your precious gift of a Diamond, please consider the helpful information below. The name is derived originally from the comparison in weight of diamonds to the seeds of the carob tree. Standardized in 1907, one carat became 0.2 grams. 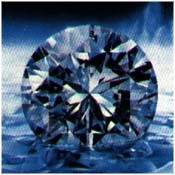 (1 gram = 5 carats) Further, one carat is divided into 100 "points". 25 points is 1/4 carat, 50 points is 1/2 carat, and 93 points is, well, 93 points, or 0.93 carat. 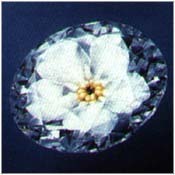 To give you an idea of size, the diameter of a 1/4 carat Diamond is about 4mm. 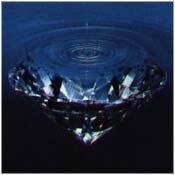 The diameter of a one carat Diamond is about 6.5mm. At Bargar Jewelry, the rule of thumb is that you the customer are in charge, but we will always emphasize quality over carat weight, or size. 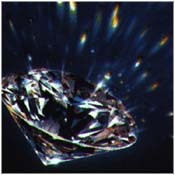 Almost all Diamonds contain some form of internal natural characteristics. Called inclusions, these can be small traces of carbon (black spots), air pockets (white spots), or other naturally occuring phenomena. They are the fingerprints of your Diamond. The smaller the inclusions, the more valuable the Diamond. Bargar's rule of thumb: We feel the internal natural characteristics of your Diamond should not be visable to the naked eye, though there can be exceptions when combining the other 3C's. The best color for a Diamond is no color at all. On a scale from D to Z, most Diamonds range from colorless, through increasing tinges of yellow or brown. Generally, the less color, the more valuable the Diamond. Bargar's rule of thumb: We try to demonstrate to you the beauty of colorless to near colorless Diamonds, D - J. You don't see a color of the Diamond. You see the beautiful spectrum of colors that the Diamond reflects. The way a Diamond is cut, or the make, dramatically influences how much fire and life it has, how much it sparkles. In a well made Diamond, the maximum amount of light is reflected back up through the top of the stone, releasing its beauty. Many people do not realize the important role the cut plays in determining the value of a Diamond. Bargar's 4th rule of thumb: We hand pick only well made Diamonds. And we would love to show you the difference it makes. Copyright © 2012 Bargar Jewelry . All rights reserved.